Introducing a brand new occasional feature for the Pop Culture Affidavit Podcast: COMMENTARIES FOR THIGNS THAT DON’T NEED COMMENTARIES! 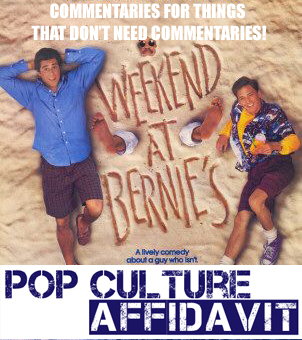 For this first commentary, I take a look at the 1989 Andrew McCarthy/Jonathan Silverman classic, Weekend at Bernie’s. So grab some popcorn, prop your dead boss up on the couch, sit back, relax, and enjoy!